Earlier this year I interviewed Harry Permutt, Master Goldsmith, at the beautiful old workshop he shared in Panther House, Clerkenwell with Kevin Cordery, Finisher, for the past fifteen years. 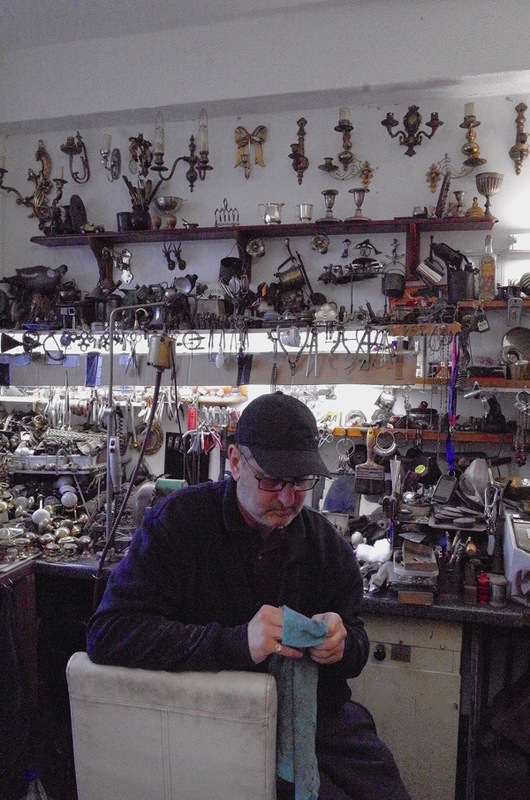 At the time, I did not write about Kevin but I was aware of him working quietly and conscientiously at his bench beneath a magnificent display of sconces he had restored. Harry and Kevin were under threat of eviction prior to redevelopment of the building and, shortly after I visited, they were given a week’s notice and told to go. Harry rang me last week to tell me that he never saw Kevin after the eviction notice was served and that Kevin had taken his life a few weeks later. Although Kevin had a history of mental health problems, Harry believes it was the eviction from their workshop which tipped him over the edge. All over London, people are losing their workspaces and livelihoods for the sake of redevelopment, as centuries-old trades are being displaced, yet the human cost of this is rarely taken into consideration. 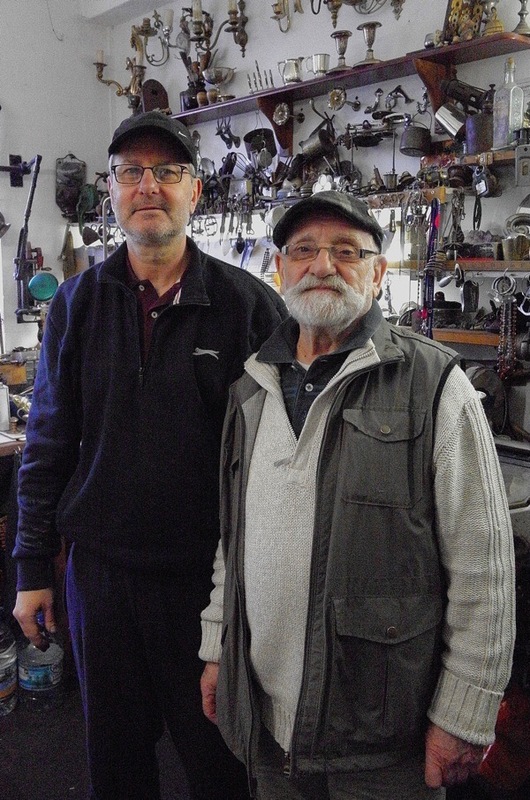 I went over to Hatton Garden to visit Harry in his new workshop - a small windowless room in a sub-basement – to learn more about Kevin, so that his story is not simply forgotten. “In this trade you meet a lot of people. I came across Kevin when I took work to him because he was good Finisher. I remember when I first knew Kevin, I was making a big three carat princess-cut gents single stone ring. It was all in platinum and I took it to Kevin to finish it off, it was a lovely job. He was based in the Colonial Building, 59/61 Hatton Garden with David and his friend Raymond, who were setters. They lived near to each other in Barkingside and they were Spurs supporters. He jumped at it, and that’s where our friendship started and took off. Then the landlord gave us twenty-four hours to get out and we moved to Panther House where we shared a workshop for fifteen years. We moved on the Sunday morning and we were up and running on Monday morning. It was tremendous and everybody loved the workshop. It had natural light, we had all our things on the wall and we used every part of that space. We were two separate businesses but anything he wanted done – instead of sending it across the road -I would do it, same as he would do it for me. It was a partnership and it worked very well. We were working associates and we used to have a laugh and a joke. At that time, Kevin started to go downhill, he couldn’t be put under pressure and he let customers dictate to him. I said to him, ‘Don’t allow it,’ but he used to agree to do jobs within minutes. They wanted it yesterday and he could never get a good price. Several times, he disappeared for about six months and I discovered he was very depressed. He wouldn’t talk about it. Before the end of last year, he disappeared and I could not speak to him. He was in a black hole. He lived alone. He used to look after his mother and father but they died. He sent a text to all his friends saying, ‘Goodbye’ and police broke into his house. I was rung at midnight and I asked, ‘Is he in A & E?’ and they said, ‘Yeah, he’s drunk.’ He used to turn to the bottle. He had so many chances to cure himself but he didn’t. I think the circumstances contributed and he had a failed marriage. Things got worse and worse, and then the move came. We were four years behind with the rent because the landlord had refused to collect even though I set up a direct debit. I think it was part of a strategy to get rid of us. Two arrogant officials came round in the morning on March 12th. They worked for the developer who had bought the building and one was the accountant who was after the money. They said, ‘You’re out, you’ve got to get out!’ I said, ‘We need at least four weeks notice.’ ‘We can’t do that,’ they told me. I explained that it was not our fault they neglected to collect the rent. Kevin did not react at all because by that time his brain was numb. He was badly affected by what happened that day and I could not get a word out of him. He was not coherent. He left early. I could not be there next day, but I heard that the guy came back and Kevin went for him. After that Kevin stayed at home, not answering the phone to anyone, and I had to move everything out of the workshop. Two guys helped me and we worked until two in the morning. I never saw Kevin again, I never even saw him before he died. I only learned in July when his wife rang me to ask if I still had anything of his. I didn’t and she said, ‘We’ll inform you when he’s going to be cremated.’ After the autopsy, it was declared an unexplained death by the coroner. He only lived a couple of weeks after he left Panther House and nobody knows exactly how he died. The police broke in and found him dead at home. Oh, how terrible and how sad. May his memory be for a blessing. Such a tragic story. It’s infuriating how so many people’s lives are destroyed by other’s greed and we can do little to stop it. I wish all the very best for Harry. one might conclude that the landlord entity has laid a curse on its own property. That is one of the saddest things I have read, how absolutely tragic. Poor soul. Depression can be so dark. I am glad you paid tribute to him. Thank you GA for letting people tell their own stories and truth, even (especially) when sad and poignant ones. So sad. But thank you for telling Kevin’s story. Desperately sad. Thank you for telling us his story. A tragic story but it reflects how the rich diversity of London is being squeezed out by pointless development, a story you have featured so many times. Rest in Peace, Kevin Cordery. May the earth gently embrace you. It is right to make this known. It makes sad sad reading.. Nothing stays the same. Change is inevitable. Yet how sad when it destroys people and these wonderful crafts and trades. Do we really care so little about keeping them alive? Could there not be a way to keep the traditions going despite the change around them? I think that’s what bothers me – that there’s no value placed on them. If there was value, we would find a way. Just sad. On the other side of the world, where we have very few ancient buildings, we read of the developers moving into areas and displacing those who have lived or as in this case, worked there for many years. I am saddened by this story and wish Harry all the best for the coming years. Has he found a new workshop? Truly heartbreaking. I hope he found the peace that he needed. A tragic story which is being repeated all over the UK because of the complex pressures people have to face and austerity. So sad to read this story. So much greed out there, a sign of the times. A story of admiration, friendship, sympathy and great sadness. But of insensitive greed too. A very sad story of a wasted life – and the often terrible human cost behind faceless profit-making and development. Thank you for your sensitive highlight of artisanal life & unnecessary death in this 21st century, rabidly gentrified, city of London. It truly sounds like a tale of Dickensian times & reflects how those that govern encourage not only the displacement of indigenous folk, but the total disregard for small businesses in favour of profitable ‘developments’, (mostly hugely expensive apartments to be bought by non-doms/or as an investment & left empty). Kevin is a sad example of how worthless the 99% of society’s peoples lives are deemed. The sooner we elect a caring government who promises to rebalance society, the sooner people like Kevin will stop dying & these skills will be saved. We need more apprenticehips for young people & to hone specialist skills. My sincerest houghts are with Kevin’s family & Harry. Thanks again TGA. What a sad tale, a decent man destroyed by greed. Murderers go to jail for killing, developers go to the bank. So sad. What a shame that greedy developers have taken over and are ruining people’s lives. What a sad commentary on the world we live in. Rest In Peace Kevin. Good luck to Harry in the future. With Kevin’s predisposition to depression and the sad circumstances of his workplace, what happened was almost inevitable. Tragic….. When will these developers learn that there is a human cost to their blunt orders, notices and evictions? The answer is, I suspect, never. The world is a sadder place now Kevin has left us. Thank you for commenting so clearly on Kevin’s difficult death. You often offer a valid expression on individuals’ frequently positive lifestyles. However this too is also serious and showing poor circumstances that Kevin has suffered. Unfortunately such difficult pressures are not usually dealt within the press. So sad. Thank you Gentle Author, for ensuring Kevin will be remembered. He is at peace now, bless him. A great tribute to a gentle man and his dedicated craft within our sadly ever changing city as our long ancient past of merchants and their work within our long historic continuance these last many centuries is now being so very sadly and violently swept away for the corporate greed by the developers as they arrive to remove and evict tradesmen from their place of historic work, all this enabled by our government with no absolute regard for our past and all of those who came long before us all, this destruction and loss seems to be our sad future with us sadly seeming no longer to have a voice as the towers grow ever taller as we who love our ancient city witness the destruction of our neighbourhoods as we have no voice as our human and long historic past is swept away forever. The future inhabitants of our ancient city will look back I hope upon this moment with great sorrow as they will see nothing but towers that in their turn will be demolished. All those who came before us left the shadows of their daily human existence within the ancient buildings they once occupied until now,that we celebrated and honoured them for all this making our city the great ancient place it has been until now. Without the past of our daily social history we will not exist our lives lost forever. Reading this story has had such an impact. The greed in this country is out of control. This so sad and beyond words. RIP Kevin. Farewell, Kevin. You will be missed. Your talent and skills will be missed. Your love of craftsmanship will be missed. The tender story of a sensitive man. Such a sad story and, having suffered at the hands of greedy developers myself, I sympathize with Harry and Kevin, but especially Harry as it sounds as if he did all that he could to help Kevin only for it all to end in such a tragedy. Well done Harry, you obviously tried very hard to save Kevin from himself but sometimes it is just impossible, I wish you well in the future. I met Harry and Kevin whilst I was training as jewellery designer in Panther House. I was so fortunate to meet these two incredible characters. Kevin and and Harry have shared a workshops since for over 12 years. I was really amazed with their skills and knowledge and I was very lucky to receive the best advice and guidance from them. I have learnt more from them than during college. Kevin’s finishes and plating work was one of the finest in Hatton Garden. I was really sad to hear about Kevin passing away. Kevin and Harry were really inseparable and now the spirit will never be the same! How utterly sad. What an absolute waste of life, my heart goes out to all that knew this gentle man who wasn’t prepared for life and struggled. Not all people are winners and it’s always the little people who will be swept aside and suffer. I wish that the Guilds still existed they way they did in the past & were able to look after these artisans. Who will replace Kevin in years to come? Thank you GA for remembering Kevin. Shame on the despicable developers, I hope they rot in Hell. I knew Kevin, and Harry for many years. I was recommended to them in my early years in antique jewellery, and general antiques trade. Both Kevin, and Harry personified true artisians, in their craftmanship, and professionalism. Kevin was always generous with his time, and knowledge. He shared his experience with me. If it was taking me to markets, or showing me antiques. The subtle nuances, between Georgian, Victorian, and Edwardian periods. Brass, silver,bronze, or decorative arts. In fact Kevin inspired my love for the decorative arts. One the best polishers I’ve ever met. As a fellow Spurs fan, a wonderful human being. What a tragic story. My sincere condolences to all who knew Kevin.